A newly translated 1930 novel by Hungarian author Márai, set among a group of young men during WWI, joins two other works by the author to enjoy recent play in the publishing sun: Embers (2001) and Casanova in Bolzano (2004). This novel is set in 1918 in a small, provincial Hungarian town, where a group of schoolboys known to each other from youth have created a gang that empowers them in the face of a larger impending crisis of war and uncertainty. 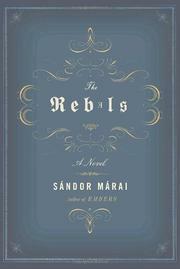 They have just taken their final exams and must decide what to do with their lives: Ábel, the doctor’s son, is orphaned, living under the care of his aunt, and, while dissolute, acts as the conscience among the others; Béla is the scruples-less grocer’s son; Tibor and Lajos Prockauer are brothers of a prominent colonel off at war, the latter boy having lost an arm in battle; and Ernõ is the cobbler’s son whose friendship with the others allows him entrée into a more genteel society. It is largely through Lajos that the gang makes the acquaintance of an obese itinerant actor overstaying his welcome in town, Amadé Volpay, whose flashy, insinuating ways draw in the young boys. The gang falls into petty thievery and even cheating among themselves, and they begin to resent all forms of authority: “They felt that the system that worked against them and dragged them back acted as perniciously in insignificant matters as in great affairs of state.” Tibor sells his sick mother’s priceless monogrammed silver to the shady pawnbroker Havas for quick money, which will eventually allow the grotesque Havas to blackmail them when he learns about their dissipated nights drinking and dancing with the actor. Márai weaves in elements of latent homosexuality amid the tangled relationships of the men and frequent chest-beating speeches about the crumbling of class and society that all point to the overall “cleansing” wrought by the war. A compelling novel that nonetheless carries the ponderous weight of the era’s events and ideas.